Promote satisfaction and mental well-being. Provide a community service, promote community development and complement existing services. 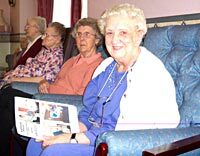 Help to maintain a quality of life for older people in residential settings. Challenge ageism and promote age awareness throughout the community. Enhance respect and value of older people by helping to bridge the generation gap. Enable people living with debilitating conditions from their own homes to continue as part of the community. Challenge social exclusion, isolation and loneliness. Spread disability awareness throughout the community. Enlighten the community regarding sensory impairment issues. Promote community spirit and involvement of people with disabilities. Increase the employability of volunteers. Actively engage with the wider community.